Fruit bouquets are a great way to explore the tastes of the season. Kids will love eating their creations as much as they enjoy making them! All you’ll need are bamboo skewers, a variety of fruits and a solution of one cup water mixed with the juice of one lemon. Wash the fruit and dry thoroughly; remove any unwanted stems, leaves or peel. When cutting the fruit, brush each piece with the lemon solution. Here are a few of our suggestions, but let your creative juices flow! Pineapple Flowers – Peel pineapple, then cut pineapple into 1/2-inch-thick slices around the core. Use cookie cutters to cut fruit into flowers or circles. Place the shapes horizontally on top of the skewers leaving room at the tip. Place a grape, strawberry or melon ball on the tip of the skewer. Grapes – Skewer six to eight grapes close to each other. Kids can add color by alternating with different types of grapes. Star Fruit – Cut star fruit crosswise into quarter-inch slices. Place the stars vertically on the skewers. Strawberry “Blossoms” – Skewer whole strawberries with the tips facing the very top of the skewer. For the look of white roses, try dipping in melted white chocolate after skewering. Try different shapes and sizes with other fruit such as kiwi, watermelon or cantaloupe. A fun way to display and share your finished bouquet is to cut a small watermelon, honeydew or cantaloupe in half. Slice off the bottom to create a flat surface, then cut a decorative edge and set on a serving platter. Poke the bottom of the fruit-threaded skewers into the melon to secure. Serve with your favorite fruit dip. Also, try making a vegetable bouquet and serve with ranch dip. 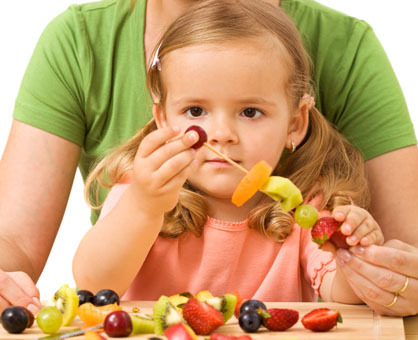 You may be surprised how many vegetables kids will try when they’re having fun. We suggest using bamboo skewers for the fruit bouquets under parental supervision. For very young children, we recommend using popsicle sticks.